Everywhere I turn I’m hearing about meditation. There are meditation retreats, podcasts, books and people pitching its benefits. I’m noticing a divide beginning: either you meditate or you don’t. Some with other traditional spiritual practices incorrectly dismiss meditation as being affiliated with a specific religion, usually Buddhism. I have had a beautiful spiritual practice that has endured for me, and it’s PRAYER, based on my Christian faith. I learned to pray as a child in the Methodist church Sunday school classroom, praying simple table grace and prayers before bed. At age 12, my family returned to the Greek Orthodox Church and I was exposed to long, poetic prayers in both Greek and English. The prayers of the church were drafted for us by saints and holy people, and we were taught it was safest to pray those specific prayers so that you were sure to approach God with reverence. For years I’ve loved Orthodox prayer especially because it requires my full attention and the prayers are all encompassing. As a young wife and mother I set up a home altar facing east with incense, a candle (representing the light of Christ) religious icons and my prayer book and would pray as the sun came up knowing that the sunrise offers promise and is a masterpiece of God. Praying first thing in the morning grounds me, keeps my mind clear, makes me have a better day. I’ve even traveled to local monasteries to be among the prayer warriors. The Greek Orthodox use prostrations during prayer. We may simply bend down and sweep the back of our hand to the floor before doing the sign of the cross across our bodies. During the spiritual boot camp of Lent, we get on the floor on all fours and bend our bodies down, praying a special prayer asking God to help us make powerful transformative changes in our lives. We are encouraged to pray at sunrise, sunset and “the hours” marking times of events such as the hour the Holy Spirit descended at Pentecost and the hour Christ was nailed to the cross. I’ve recently broadened my prayer life with influence from Protestant literature. I read “Let Prayer Change Your Life,” a book that encourages journaling your prayers; nirvana for someone who loves to write. Once I began the journaling practice my heart opened up immeasurably and my prayers became more personal. In times of distress my prayers seem as powerful as those of the psalmists. I now use my Orthodox prayers along with prayers that I journal. As a lawyer and mediator (careful, meditate and mediate can get confusing!) I enjoy praying for clients. On rare occasions I do this with them, but most often it is done silently after they leave my office or before we enter into court or mediation. In “Praying for Strangers” the author decided to find a person in her path every day and to offer to pray for them. She chronicles the stories of the people she touched through this practice and the conclusion is an obvious one: we can all use prayer. Prayer and meditation aren’t mutually exclusive. If there were a “mantra” from the Bible it would come from Philippians 4:8: “Finally, brothers and sisters, whatever is true, whatever is noble, whatever is right, whatever is pure, whatever is lovely, whatever is admirable—if anything is excellent or praiseworthy—think about (or in some translations, MEDITATE ON) such things.” For me that means watching the news less, and meditating on these things more. Like meditation, prayer doesn’t come easily and to receive the full benefit it must be a consistent practice. Praying to God in the car or when you think of it is great but that type of “prayer on the run” might be similar to meditation on on the run. When my prayer life is disciplined and rich I have much more clarity, serenity and focus. I’m convinced meditation and prayer can live in tandem in my spiritual life and I’m choosing not to get bogged down in semantics. Recently I gathered a group of lawyer colleagues to meet weekly and study “The Anxious Lawyer” , a book for lawyers that provides instruction on how to meditate. A solid spiritual practice can bring richness to our lives. Whether it is solitude, nature, prayer, meditation, creativity or something else, we can each choose a method that resonates with us. In my love affair with perfectly foamed lattes, I’ve spent many happy days at Starbucks. When the children were small, my friend Laura and I would meet there every single day. I would have a latte, usually with nonfat milk, except when I went through my soy phase. Laura would have an Americana with room for cream. The Phoenix area has a million Starbuck’s, so we would call each other (before texting was available) to coordinate which location was convenient for our meeting, based on our schedules. “I’m picking up the triplets at school early for a dental appointment,” she might say. “I will be at the church, can we meet half way in between?” I’d respond, and for several years we accommodated each other without the slightest amount of stress. “I need to go first today,” one of us would say once we sat down with our coffees. We poured out stressors and anxiety becoming each other’s amateur therapists. People are in disbelief that we only missed a handful of days over the course of several years, before I moved back to Iowa. Our daily meetings grounded me during years where I was lonely because of a traveling husband, unsure how to raise kids, and yearning for my lawyer world during a period as stay at home mom. Laura could validate my feelings, tell me the kid’s coughs needed Robitussin and being a lawyer herself, explore the injustices of the OJ Simpson case based on an analysis of the evidence. I supplied similar support to her as she raised triplets with her busy emergency room physician husband. By the time we finished our coffee and dashed to our respective mom mobiles to get back to our duties we were poised to face life with a fresh approach. At our favorite Starbucks, Carl was the manager. Because we were regulars, it was like meeting another friend when he was working. When he transferred locations we moved our rendezvous to his new store whenever possible. When I was divorced from my children’s father, I was in between jobs, having given up my status as VP of a California based mediation firm to try to save a failing marriage. Post-divorce I was left having to regroup to get a job in Scottsdale, and doors were not opening. Carl was puzzled knowing I was a lawyer, but also knowing Starbucks provided medical health benefits, which I needed. The next thing I knew I was handed a green apron and a post at a new Starbucks Carl was managing in a stylish part of Scottsdale. My twenty-something coworker Maggie became my guide to the Starbuck’s world. Keeping up with a busy caffeine -seeking crowd, was not easy. Some customers were rude and impatient, some downright hateful, others were pleasant. Those who said hello, asked how I was getting along as the “newbie,” and called me by name were a joy. I was working hard, on my feet, trying to live up to Carl’s rigorous standards for a clean store, going home tired at the end of my shift, particularly on days when it had started at 5 a.m. If I would gripe to Maggie she never engaged, but instead was always upbeat, expressing gratitude for her job. Maggie would often excuse herself abruptly for a bathroom break. I became curious as to why she would leave her work station so suddenly. Eventually I asked a coworker. I was shocked. 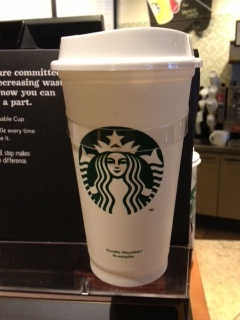 Here I had been a prissy Scottsdale lawyer/mom who had thought I was so noble working at Starbucks. Right beside me was Maggie, struggling to survive. I eventually asked Maggie if there was anything I could do to help her. She seemed disappointed that her secret was out, and basically said “Thanks so much but I am fine. I enjoy working with you.” That was it. The next morning when it was still dark, as I went in to open the store I saw Maggie getting off the bus. For the first time in my life, I was unable to know what to do to help someone. I decided the best thing I could do to honor her was to watch her humility up close and to learn to do something about my own ego based on her example. My initial instinct was to lash back saying: “I will have you know I am a lawyer and I doubt YOU are qualified to argue before the Supreme Court!” At the same time, I saw Maggie down the counter from me, smiling and selecting a pastry for a customer. Somehow I was able to channel what I’d learned from Maggie. And strangely, in the turn of a moment, I really did want the woman to have a wonderful day. For all I knew she was in a struggle of her own, unable to handle it with Maggie’s grace. Eventually I left Starbucks and Arizona, resuming my law and mediation practice in Iowa. Leaving Laura’s friendship was devastating. I visit Arizona often and we always “do coffee” daily while I am there. I ‘ve gone back to the Starbucks where I worked. It’s been totally remodeled. Carl is gone to stores unknown. Maggie is not there. I wonder if she is even alive. Now, when I walk into a Starbucks I take a moment to look the barista in the eye, smile, make small talk and even call them by name. I do the same with the clerk at the grocery store and the cashier at the gas station. I know from my work at Starbucks that a little kindness makes all the difference. And all of our lives, matter. This post was originally published in 2013. My son Clint, age 23, has started working part time as a barista at Starbucks so it reminded me of this post. Welcome to the barista family son!